New P100 Chronograph from the company Borgward. 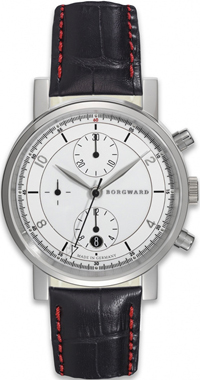 Borgward was a German watch company. Borgward was a German watch company. Today the brand announces the release of its new P100 Chronograph, presented in a sporty design. The round body of the model with a diameter of 40 mm made of stainless steel. The novelty is represented in several color versions, with the face of milky-white, matte black or silver. The dials are equipped with all the colors overlaid with Arabic numerals and black painted hour indexes. Hour and minute hands are made in gray, and second – in black. In the black painted as small arrows counters to zero. In the situation of “12:00” is a 30-minute counter at position “6:00” – 12-hour counter, while the label “9:00” – small seconds. In “6:00” is also a small circular aperture date. It protects the dial sapphire crystal. The back of the model is also covered with a sapphire crystal. New P100 Chronograph collected on the basis of the Swiss ETA automatic movement Valjoux with functions: hours, minutes, seconds, date, chronograph. Chronograph comes on a black leather strap or stainless steel bracelet. Buy P100 Chronograph watch with leather strap can be for 2285 euros, and a bracelet – for 2455 euros.